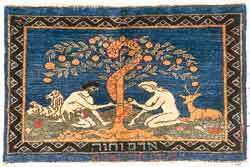 At the turn of the twentieth century, the Bezalel School of Arts and Crafts in Jerusalem produced masterpieces of modern Judaica. Many examples now grace museums and cherished collections the world over. 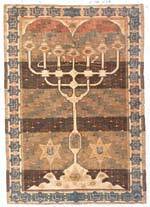 Included in our offering, we have reproduced the exquisite carpets that were crafted in the ateliers and weaving rooms of Bezalel. 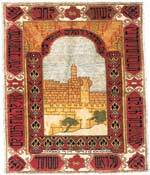 Each carpet tells a story complete with Jewish symbolism, recalling scenes from the bible, historic sites in the Holy Land and imagery of a new Jewish identity. 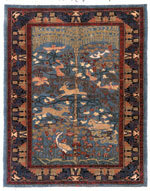 Woven by hand, knot-by-knot, using the finest handspun wool and all natural dyes, this collection captures the spirit and beauty of the original carpets of Bezalel.